At Willrich Precision Instrument, we provide both flexible and solid hole location gages which are slotted to right angle increments to assure the location of the thread line, irrespective of the hole dimensions. This type of tools determines the projected tolerance zone, perpendicularity, and true location of tapped hole or threaded holes, usually with the help of a measuring device, Coordinate Measuring Machine (CMM). You can also use them to determine centerline distances between holes. Solid Threaded Hole Centerline Location Gage is similar to a Flexible Threaded Hole Centerline Location Gage except that it is not split. The Solid Threaded Hole Centerline Location Gage is screwed hand-tight to the part surface so that it is perpendicular to the thread. The pressure against the collar, as it is tightened, forces the Solid Threaded Hole Location gage to self center against the internal thread flank angle. The bottom side of the collar has been relieved so that only the outer most diameter will contact the surface of the part. Screwing against a sloped surface may tip the locator and mis-position the Threaded Hole Location Gage. 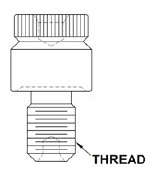 Flexible Threaded Hole Location gage is made to the maximum material thread pitch diameter. The threaded end is slit, usually twice, and the thread is expanded so when screwed into the internal threaded hole the Flexible Threaded Hole Centerline Locator Gage is snug in the hole and conforming to the internal thread pitch diameter cylinder. 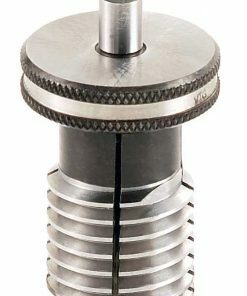 This style has the advantage of positive pressure against the internal thread pitch diameter cylinder, but there is an issue of whether or not the spring loaded thread is in fact concentric with the known cylinder. With more than 45 years of expertise in the field of metrology, inspection and gaging, Willrich has come a long way in providing exceptional instruments for a wide array of purposes and conditions. Customer satisfaction is our primary objective and we are all ears when it comes to sorting out your queries concerning purchase of quality products in our catalog. You will find that the hole location gages we carry help to make the hole dimensional measurement process an easier and accurate operation. Give us a call today at 866-945-5742 or send us an email at sales@willrich.com, in case you have any inquiry regarding which type of hole location gage to buy. We offer the most competitive prices in the market and will be glad to assist you with your purchase.